Quality but not quantity, the best choice of cherry blossom viewing: The biggest three cherry blossom trees in Japan. 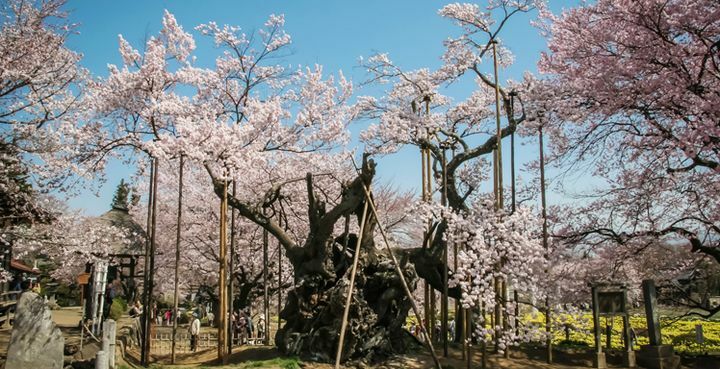 Japan has many cherry blossom viewing spots, this time we will introduce the biggest “ Three giant cherry blossom tree), they are absolutely on quality instead of quantity. Although there is just one cherry blossom tree, but the beauty and impressiveness is not less than a row of cherry blossom tree. Before we start, let us explain how to evaluate the 『Three Giant Cherry Blossom Trees』. 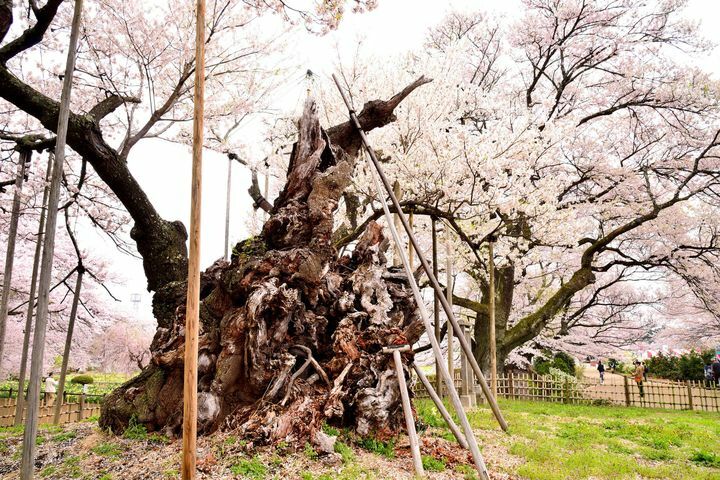 As early as 12 Oct 1922, there 5 giant cherry blossom trees were certified as 『Natural Monument』, amongst them the oldest three that are what we call the 『Three Giant Cherry Blossom Trees』today. when you see her being supported by the wood, you can’t help but feel so moved. Japanese treats the trees so good. The estimated blooming time of the Awasumi Sakura is on 4/3 in 2016 and the peak blooming time is around 4/10. The second cherry blossom tree that we will introduce is 『Miharu’s Takizakua』, it is located at Sakurakubo Taki, Miharu-machi, Tamura-gun and Fukushima Prefecture. The estimated age of the tree is over 1,000 year, it is a kind of 『 Red Weeping Cherry Tree』。「滝」means waterfall. Therefore 『滝桜』means the cherry blossom tree is as spectacular as a waterfall. It looks incredible from distance. No wonder Japanese say they have to see the Miharu’s Takizakura once in a lifetime. The estimated blooming time of the tree is on 4/13 in 2016 and the peak blooming time is 4/18. Kojiro Sakura is located inside the Jisoji template at Mukawacho Yamataka, Hokuto of Yamanashi Prefecture. Kojiro Sakura itself is listed on the Japan 『Natural Monument』, it is a kind of Yamataka Kojiro Sakura. It estimated age of the tree is around 1,800 to 2,000year. It is the oldest amongst the 『Three giant cherry blossom tree』. 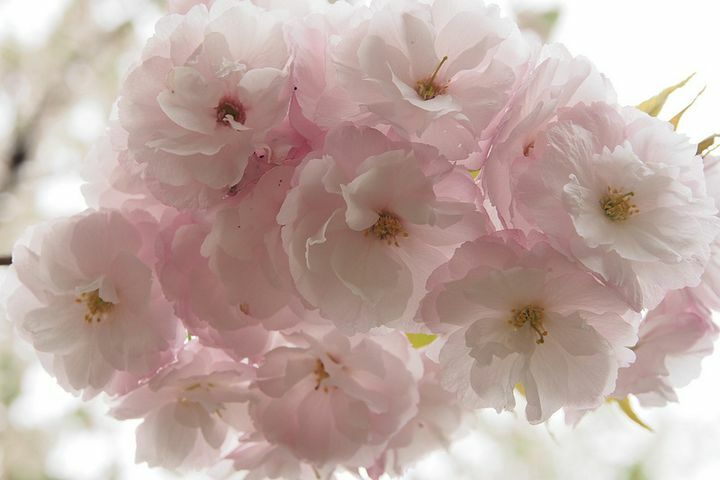 After seeing it, most Japanese believe it is the most beautiful cherry blossom tree that others are incomparable to it. The estimated blooming time is 4/8 this year. If you have the chance go and have a look of it.